After having worked in print shops around the Nashville, TN area after college, Brian Peat decided it was time to move back to his hometown of Westerville, Ohio in early 1998 and start his own company. "The Peat Group" was born with the goal of serving the needs of Mac users in the Greater Columbus, Ohio area. Along the way, Brian started dabling in web design. After creating several straight html sites, he stumbled on Mambo, a new kind of "CMS" or Content Management System. On the side, he began experimenting with several different CMS's including Wordpress and Drupal. Then he discovered that Mambo had been split or "forked" and a new CMS called Joomla! had been created. Pretty much right from the early days of Joomla's existance, Brian was creating sites with it for some of his consulting clients. Eventually most of his free time was spent working in Joomla and advancing his knowledge in it. 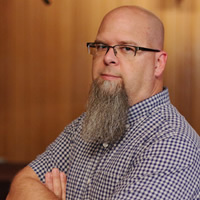 In 2009 Brian sold off his consulting business and moved his growing family to the Harrisburg, Pennsylvania area to attend a ministry school with his wife. On the side he continued to create sites with Joomla (and sometimes Wordpress) and eventually landed a job at the ministry that ran the school he had attended. There he managed multiple websites and launched several new projects. Then in the summer of 2014, Brian moved his family to the Nashville, Tennessee area and launched his full time web and branding business. In 2015, the company name was changed to Peat Creative to give it a fresh start. More services were added so that now we can not only handle your website, but also your presentation needs, conference tech support, print needs or even help you run your own webcast. We have extensive experience in managing A/V needs at small conferences. If you've ever wished you had a dedicated A/V tech at your conference who wasn't just hired by the convention center or hotel, we can help. To learn more about our conference services, click here. While we specialize in building websites with Joomla, Wordpress and Moodle, we have no problem learning a new CMS or steering you toward a different technology if we think it would work better for you. If we can't handle your request, we'll either refer you to someone who can, or we'll manage the entire project and use our network of developers to make sure the job gets done right. We look forward to working with you, and as always, feel free to contact Brian at to talk about what we can do for you. Because Brian believes in giving back to the opensource community, he is a part of several Joomla volunteer teams that help keep Joomla alive. He's donated his time and skills on several online design projects for joomla and also a presentation for the release of Joomla 3.4. Not only that, but whenever we pay for custom modifications or extensions from a Joomla developer, we always encourage them to roll our code back into their public release so everyone can benefit.